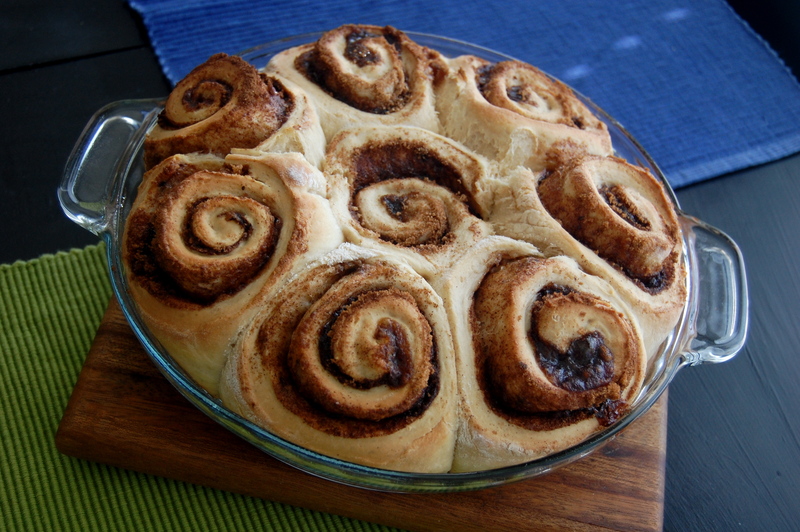 I really wanted to make cinnamon rolls one day, but most of the recipes I found required ingredients I didn’t have on hand. I had already told Stephen of my plans, however, so there was no turning back. After a quick search, I found a recipe (with normal ingredients!) on this adorable blog called Shoplifting in a Ghost Town. Side note: Who calls them cinnamon buns? It sounds like a hot dog bun. Mustard and ketchup for breakfast, mmm-mm! Hers was a little hard to follow, because you have to scroll all over the place to match up the ingredients with the directions. However, it’s the cutest recipe I’ve ever seen, so at least go check it out just to make you smile! It’s pretty easy to make, but you need to block out some time to let it rise. 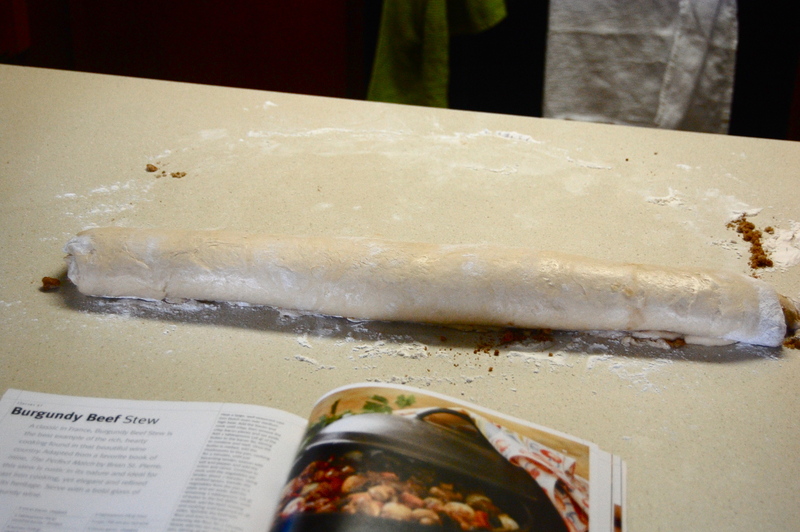 I actually made the dough ahead of time, let it rise and then stuck it in the refrigerator for a few days. It lost some of its “pouf” because of it, but not much, and it still turned out perfect. I would definitely go the refrigerator route again, especially if I wanted to make the cinnamon rolls for breakfast without a huge wait. 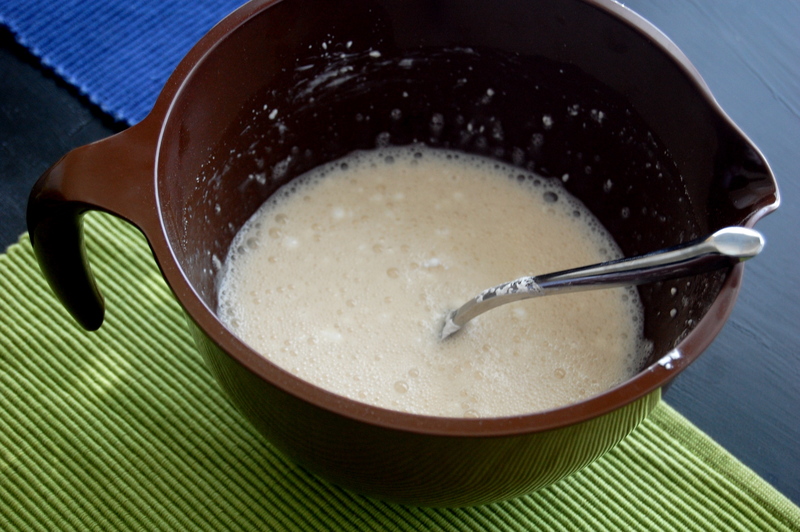 Warm the milk in a mixing bowl and pour on the yeast. Let it sit for a few minutes before stirring. Add the 1/2 cup sugar, 1 tsp salt, 2 Tbs vanilla, 2 eggs and 6 Tbs butter and mix. Stir in the 4 1/2 cups flour. I started with 2 cups, stirred in 2 more cups, and then added the last 1/2 cup. It should be thick enough to knead together. Heavily flour a flat surface (like a kitchen counter) and knead the dough for a few minutes until it’s smooth. Flour your hands too! Lightly grease another bowl and place the ball of dough inside. Make sure the bowl is big enough, because the dough should double in size after rising. Cover with plastic wrap or a damp dishtowel and let it rise in a warm place. I set the bowl on a stool near a space heater (but make sure it doesn’t get too hot!). It should take about 1 1/2-2 hours, or until it doubles in size. While it rises, you can mix together all the ingredients for the filling (except the butter) and set aside. 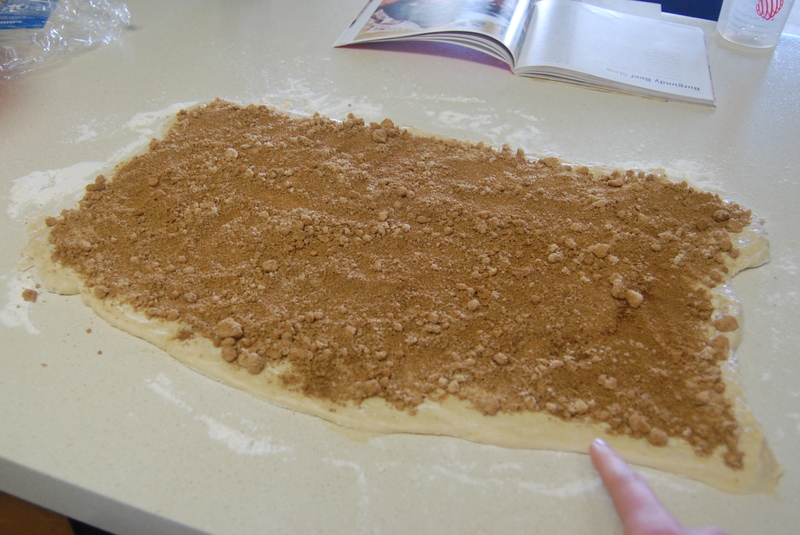 Spread the 2 Tbs of softened butter on the dough rectangle. And by “spread,” I mean smear it around with your fingers. Cover it with the filling mixture. Roll it up long-ways and cut about every 1 1/2 inches. Place in a buttered dish (I ended up using 2 small dishes for 12 cinnamon rolls). Optional: let it sit in the pan for about 30 minutes to expand some more. I didn’t do this and they turned out great. Bake at 350° for about 40 minutes. 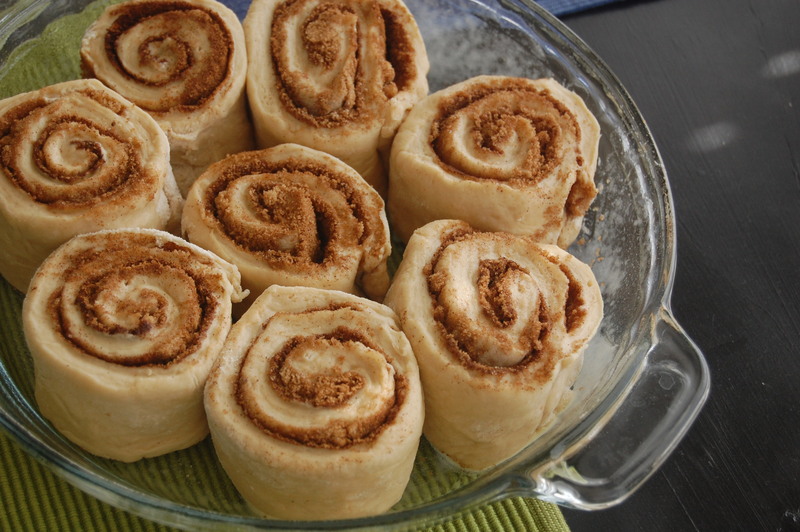 Beat together the frosting ingredients and pour on top of the cinnamon rolls when they’re finished. Devour with your husband and sister-in-law (or whoever is in the vicinity). Leave no prisoners. man that looks sooo good!!!! Those cinnamon rolls look incredible! I especially love the sound of that cream cheese icing! The cloves in the filling sounds odd! 🙂 Is the taste overpowering or fine? I’m so sorry I forgot to reply! I hope it’s not too late. 🙂 They are right in the middle. They’re not the soggy, super-sticky kind, but they are not dry either. If you wanted to be on the safe side, you could increase the butter in the filling to 3 Tbs. The taste of the cloves isn’t overpowering at all. 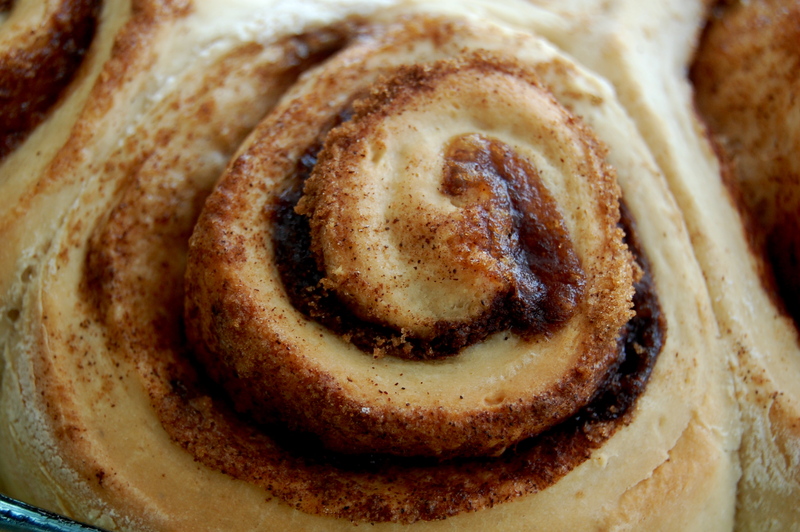 It is actually a nice touch, since a lot of cinnamon rolls get in a rut and taste only like plain cinnamon.